When I was in Scotland, I visited many crofter's homes in the Highlands with my uncle, a minister of the Church of Scotland. The typical home of the Scotch peasants consists of a passage and a "But and Ben" on the ground floor, and a loft above the "But" is the living room or kitchen, and the "Ben" is the best room. In both are the concealed beds always known as box-beds. Sliding doors hide the beds during the day. I have seen these beds in a modern flat in Glasgow, and in crofters' homes around Grantown, also at Cromarty, Inverness, Dingwall, Oban, and Helensburgh, but never heard them called "The Hole in the Wall;" they are always termed box-beds. I believe Robbie Burns was born in one, and I think so was Hugh Millar. SMUGGLING. To the Editors of the Sydney Herald. GENTLEMEN,--As the late seizure of spirits made by the Water Police, is now the general topic of conversation, 1 have no doubt it will arouse the Government from the state of apathy and indolence in which it has been indulging itself for the past two years, and show its members the necessity of taking the most prompt and energetic measures, in order| to put a stop to a practice which threatens materially to diminish the revenue, and cause distress to the fair trader : for there can bono doubt, that although the quantity lately seized is large, yet we are warrantee! to say that it bears a very small proportion to that already successfully run during the past two years, or since the extra inducement has been held out by the Government in the increase of duties ; an inducement which would have yielded to the smuggler of the above spirits, had he succeeded, a clear profit of upwards of £280 above the amount of duties, hail they been as before, at 10s. 2d. per gallon; with such a fact before our eyes, let us ask the Government what has it done to prevent these nefarious transactions? Has it increased the number of revenue officers? Has it established any outports along the coast? No! Or, in a word, has it taken such measures as the nature of the coast, and the inducement offered to the smuggler, would lead us to expect? We are reluctantly compelled to answer in the negative. But leaving for a short time the above, let us take a slight glance at the manner in which these smuggling transactions are carried on, which is simply as follows : a merchant enters for exportation a certain quantity of spirits, signs the usual bonds, passes the proper entries, which being duly accomplished, a Custom House officer is appointed to see the goods properly shipped, which is accordingly done; thus far everything goes on correctly. After receiving the quantity of spirits and tobacco intended to be run, the vessel clears out for Guam, New Zealand, or some such port, hovers about the coast some time to see if she is observed, runs into Broken Bay, and there discharges her cargo, which is stored in some secluded spot, and brought up to Sydney in small quantities, (according to the demand), by the various coasters in the employ of the agents at those parts; these, upon arrival, land their cargoes without the slightest examination, which are accordingly carted away and deposited in the warehouses, and the smuggling finally and successfully completed. While the trial of those responsible appeared in local newspapers late in 1842, four convicts were sent to build a three roomed timber Customs House and track up to the headland. "Form a winding path up the south face of the mountain by clearing the bushes and making steps where required, to a flat place on the top near the western end where a sentry box or watch hut is to be built and a flag staff erected." PITTWATER, BRISBANE WATER, AND THE HAWKESBURY. These places, although near Sydney, are but little frequented by Sydney people, except by such of the coasting traders as go there for grain, timber, and shells. No part of the country, however, affords a better field for the home tourist toil-worn citizen who is able to spare a days from his ordinary avocations will find it much cheaper, as well as more healthful to take a voyage in this direction with his family than to visit the interior towns. During, the summer season, there are many small coasters lying idle at their moorings in consequence of their having little or nothing to do, and these, with a couple of seamen to work them, may be hired for a mere trifle for the task. Several days will be occupied in the journey upwards, but on arriving at Windsor the tourist may return to Sydney in a few hours, leaving the men to bring back their vessel. The voyage from Sydney to Broken Bay, does not occupy more than four hours, if the wind be fair, and the rest of the trip is in smooth water, so that even those persons who are apt to suffer much from sickness, have very little to dread in such a journey as the one we have alluded to. The coast between the north head of Port Jackson, and the south head of Broken Bay presents little or nothing worthy of notice except a large natural archway in the rocks a few miles from the latter place, which is generally known among the coasting traders, as "hole in the wall." Baranjuee, the south head at Broken Bay, is also the eastern head of Pittwater. It is a small peninsula of tall cliffs connected by an isthmus of low and tolerably fertile land with the hilly county which separates Pittwater from the sea. Pittwater is not unlike Port Jackson in its general features, and extends for about ten miles to the southward, branching off into a number of picturesque bays and coves. There are few habitations on the banks of this estuary, these few are situated near its head. Several small houses may be seen, which have been inhabited by men employed in the production of Lime but which have been abandoned in consequence of the supply of shells having become exhausted. Near the head there is s small island, which contains a number of fruit-bearing peach trees, the remains of former cultivation. Under the headland of Baranjueo on its landward side, just at the entrance of Pittwater, is the Custom-house station. The site has been admirably chosen for this purpose. The heads around protect the station from tempestuous weather and furnish look-out posts for the officer and his men, from whence a view is commanded of all the surrounding land and water, that no vessel can pass in that vicinity without their seeing it. The station has a picturesque appearance from the water, and a closer approach does not, as in many instances, diminish its attractions. A very good garden has been formed in the rear, but owing to the rocky nature of the soil, this must have been a work of great labour and perseverance. Fresh water however, is unfortunately rather scarce. It is obtained from the high rocky land above the station, and conveyed to the houses by meanz of troughs made of the cabbage-tree. At the present time, owing to the long continued drought, and to the great heat of the weather, there is no flow of water along the troughs during the day, but during the night sufficient water runs down to supply the station. Mr. Collyer, the gentleman who at present commands at this place, has acquired a well-merited popularity throughout the settlements around. In the performance of his duties he is indefatigable, and having succeeded in putting down the smuggling trade and other irregularities which went on formerly pursued to a great extent in this quarter, he has, of course, annoyed some of the inferior class of settlers, but his exertions are beneficial to the many, and to the coast traders he often renders most valuable assistance. A few weeks only have elapsed since a vessel was driven ashore near Mount Elliott, which would have become a total wreck but for the prompt and able assistance of Mr. Collyer and his men, by whom she was got off before she sustained any material injury. There are five men attached to the station. The coxswain, well-known among the settlers and the coasting traders by the familiar name of Larry, is a fine smart seaman, well acquainted with the surrounding waters. On the occasion just referred to he was particularly active. 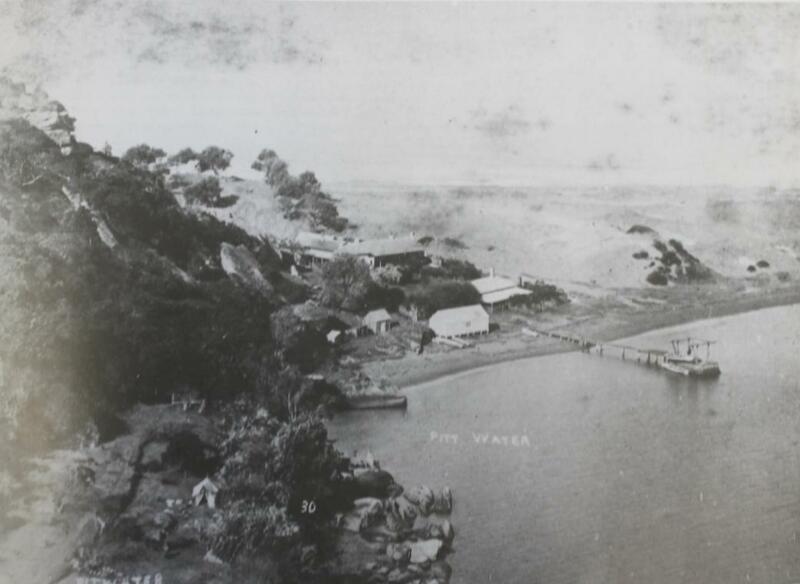 At present there is but one regular trader to Pittwater, which is run by a Mr. Anderson, who lives two or three miles above the custom house station, on the western shore of the estuary. The only traffic, we believe, is in shells, the produce of the Pittwater settlers being conveyed overland to North Harbour, and from thence in boat to Sydney. To Brisbane Water and the Hawkesbury, however, there is an extensive bade is agricultural produce and timber.. The their trade has fallen off a good deal, in consequence of the very low price at present given for the shells by the Sydney lime-burners, but many of the smaller coasters are still engaged in it. About Pittwater there is no great deal to be done in the way of shooting or fishing, but Brisbane Water and the Hawkesbury present great attractions in this way. there is a singular blunder in this respect in Wells' Gazetteer. He speaks of Baranjuee as the residence of one or two old fishermen, who supply the Hawkesbury as far as it is navigable. Now, there is no one living at Baranjuee but the Custom-house officer and his crew, and as for marketable fish, they are in that vicinity rather scarce, owing to the shallowness of the water, and perhaps also to the immense number of sharks which traverse it. The number and voracity of these monsters is almost incredible. They will run into the shallowest water in search of prey, and to bathe even in water knee deep is therefore dangerous in the extreme. The Hawkesbury, on the contrary, abounds with fish of every description. It is here and on the north side of Broken Bay that the lobsters which are sent to Sydney are for the most part procured. They are taken generally during the night, and are kept in a sort of pen erected in shallow water, until an opportunity occurs of sending them to market. The most remarkable object in Broken Bay is a small .rocky island called Mount Elliott. The cliffs are a great height, and are the residence of an extensive colony of goats, the progeny of a few individuals which were placed there to feed in times gone by. There is no water here beyond what lodges in the hollows after rain, but the hairy settlers on the island find sufficient aqueous nourishment in the moistened herbage. The scenery both of Brisbane Water and of the Hawkesbury is beautifully picturesque. The latter is pre-eminently so. In the course of the hundred and twenty miles of navigable river between Broken Bay and the town of Windsor, there is every -variety of scenery. The overhanging rock, the man-grove swamp, the bank clothed with willow and casuarina, the grassy slope, the field of waving corn, and the cheerful orchard. Sometimes the river winds amidst groups of cottages and mansions; at others, its banks exhibit the most wild and romantic features. The Hawkesbury and its tributaries water an immense tract of country some of these tributaries are navigable to a considerable distance. The map of Cumberland attached to Wells' Gazetteer makes up, in its minute correctness as to the course of the Hawkesbury for the trifling blunder committed in the text as to the settlement and trade of Baranjuee, and may be depended upon as a guide by persons navigating these waters. Settlers at Brisbane Water occasionally walk to Sydney, but the journey is a toilsome one. By getting to the head of Pittwater, the distance is diminished to about twenty-two miles ; but the route is an awkward one for a person unaccustomed to bush travelling, there being no other guide than cart tracks, which are very apt to mislead, as there are routes to be avoided, both to the right hand and the left. Old bushmen will tell you that it is impossible to miss the road; but you will find it exceedingly possible to do so when you come to a spot where three or four tracks diverge in various directions. It is better, if possible, to have a companion who has crossed the country before. The journey is an interesting one. On the road there is some pretty scenery; and in several places there are splendid views of the ocean. Two lakes (or lagoons, as they are here called) are passed on the road; the largest of which, Narrabeen, is several square miles in extent, and has many small islands on its surface. It is for the most part shallow, and abounds with fish, which might be taken with the greatest ease, as a net could be hauled through any part of it. at present it is separated from the ocean by a barren sandy neck; but after floods this is covered, and the traveller is obliged to wade through the water for a considerable distance. Barrenjuey [i.e. Barrenjoey], Broken Bay 1869 Jan. 16 by George Penkivil Slade. nla.pic-an6454687, courtesy National Library of Australia. FATAL OCCURRENCE AT BARRANJUIE, BROKEN BAY. Albert Thomas Black, courtesy John Black, great grandson of A T Black. To ALBERT T. BLACK, Esq., Customs House Officer, Barranjuie. Sir,- We hasten to avail ourselves of the first opportunity since our arrival in Sydney, publicly to return you and your courageous crew our sincere and heartfelt thanks for having, with the assistance of the Almighty, been the means of rescuing us from a watery grave on the above occasion. The fact of your having lowered and manned your boat and pulled a distance of over a mile in an almost incredibly short time during a gale of wind, and in a boisterous sea, reflects the greatest credit on you all – one minute's delay would have caused a further loss of life. Your courage was scarcely exceeded by your kindness in the careful attention bestowed by yourself and family onus when carried in an exhausted and almost dying state into your house, where our wants were carefully supplied, and all seemed to vie with each other in doing the utmost in their power to add to our comforts. Your sympathy and untiring exertions to restore animation to our unfortunate companion, although without success, deserve more praise than we can find words to convey, and reflect credit upon the Government for having men like yourselves in the service, who show by their actions that they are willing and prepared to risk their own lives to save their fellow -creatures. In conclusion we trust that your life may be long spared to your wife and family ; and we feel convinced that should a boat accident occur in Broken Bay whilst you are there life will not be lost, if in the power of man to save it. Having remained under your hospitable roof for nearly three days, we bid you a hearty farewell, and assure you that the name of Albert Thomas Black shall be engraven on our hearts as long as it pleases God to spare us. We further desire to express our admiration of the heroic conduct of Master JEREMIAH CONNELLY, who nobly ventured out in a small boat with the object of rendering assistance, thereby showing his willingness, and incurring a great risk, to save life, if possible. If Charles Jeannerette did testify against Mr Black it did not stop the two from being best of friends and entertaining the official party at the laying of the foundations for the lighthouse or Mr Black joing Jeanerette when he hosted other dignitaries in trips up the Hawkesbury river. Barren Joey Lighthouse (Burrin Ju) [picture]. A. J. Vogan (Arthur James), 1859-1948,[ca. 1910 - ca. 1915] Image H82.254/8/34, courtesy State Library of Victoria. Just under Barranjoey is the pretty cottage of the Customs officer, Mr Ross and the residences of those connected with the Customs station. There is evidence of taste in the gardens and the other cultivated ground around thestation, and an air of peaceful comfort quite refreshingto those engaged in the turmoil of city life. From the station to the flagstaff on the top of the mount, theascent is by a pretty walk, which must have taken to make and on either side are various shrubs so planted as to throw an acceptable shade over the road. The view from here is a fitting climax to those on the journey down -to the south-west is a harbour that would hold the fleets of Great Britain, to the west the mouth of the Hawkesbury, to the north Pyramid Island and the entrance to Brisbane Water, and the innumerable inlets that dent the land stretching far into the sea and forming the South Head of Broken Bay, and on the eastthe unbroken curve of the Pacific. The Ross's house had a pretty rustic appearance with its neatly painted front, and leaf covered verandah, but, as he informed me, the beauty was all in appearance, since the house, a timber erection, had been built so many years ago, that slabs and posts and weatherboards were now so far decayed as to make it doubtful on the occasion of every gale of wind, whether it would stand it out, or succumb before the blast. However, by dint of constant painting and repairing, it is kept in an apparently comfortable state, despite the rottenness that lurks below the surface, and what is worse, the leakage from the roof above. In front of the house is a small, but well kept garden, on a terrace, built up on the side of the hill evidently after a considerable amount of labour, and overlooking from the farther side the men's hut and the beach beyond. From the side of the house, a wicket gate opens upon a broad pathway leading down to the beach, formed into broad low steps, by means of protecting logs, behind which gravel and stones have been laid just sufficiently off the level to secure drainage. The men's hut is a large slab house with a shingle roof admitting wind and rain everywhere, since the lower ends of the slabs have completely rotted away, and they rock away crazily in the wind in all the helplessness of extreme old age; whilst the boat's crew have their slumbers protected from the pelting rain that would otherwise penetrate the leaky rotten roof, only by the large tarpaulin, or sail, or whatever it is, that is thrown over it. A large boathouse, under which was stored the new and crack boat of the station, stands to the right of the men's hut, with a workshop, in which was a very good and complete supply of tools, attached to it; and at the back, under a shed or lean-to, a little punt, sufficient to accommodate three or four persons, was in course of construction, for use on fishing expeditions. The Ross's house had a pretty rustic appearance with its neatly painted front, and leaf covered verandah, but, as he informed me, the beauty was all in appearance, since the house, a timber erection, had been built so many years ago, that slabs and posts and weatherboards were now so far decayed as to make it doubtful on the occasion of every gale of wind, whether it would stand it out, or succumb before the blast. However, by dint of constant painting and repairing, it is kept in an apparently comfortable state, despite the rottenness that lurks below the surface, and what is worse, the leakage from the roof above. In front of the house is a small, but well kept garden, on a terrace, built up on the side of the hill evidently after a considerable amount of labour, and overlooking from the farther side the men's hut and the beach beyond. From the side of the house, a wicket gate opens upon a broad pathway leading down to the beach, formed into broad low steps, by means of protecting logs, behind which gravel and stones have been laid just sufficiently off the level to secure drainage. The men's hut is a large slab house with a shingle roof admitting wind and rain everywhere, since the lower ends of the slabs have completely rotted away, and they rock away crazily in the wind in all the helplessness of extreme old age; whilst the boat's crew have their slumbers protected from the pelting rain that would otherwise penetrate the leaky rotten roof, only by the large tarpaulin, or sail, or whatever it is, that is thrown over it. A large boathouse, under which was stored the new and crack boat of the station, stands to the right of the men's hut, with a workshop, in which was a very good and complete supply of tools, attached to it; and at the back, under a shed or lean-to, a little punt, sufficient to accommodate three or four persons, was in course of construction, for use on fishing expeditions. Mr Black passed away in August 22nd, 1890, at only fifty years of age, at his then home at Woollahra. His wife, Kate, did not leave the Customs Station until February 24th 1891, continuing her duties as postmistress during this time. Mark Thomas Cohen was stationed at the Customs Office until August 1891 when Captain W H Champion and his family then took over the duties. Captain William Henry Champion was then the head Customs Officer from 1891-1903, his wife and ten year old daughter sharing the 'postmistress' duties. His wife, through Duguld Thomson, MP, was appointed to Pymble Post office on the Captains retirement in 1903. Barrenjoey Lighthouse, ca. 1900-1910, Image No: a116418, courtesy State Library of NSW; Mona Vale Library Image's state this is circa 1890 and Captain William Champion is gentleman to right of this sepia photo. MR. C. E. STUART. Mr. Charles Edward Stuart, who came to Sydney in 1884 with the late Edward Hanlon, then champion sculler of the world, and who was later a prominent member of the old Mercantile Rowing Club, died recently at his home, 22 Milner-street, Mosman. 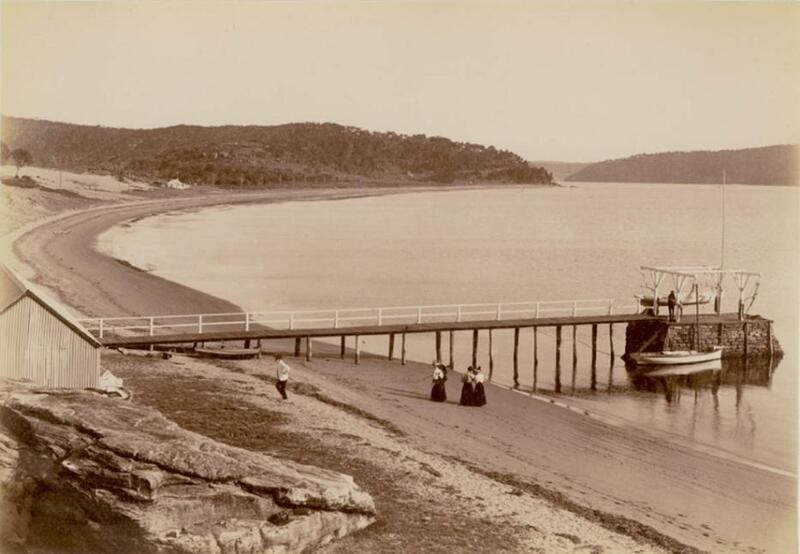 Mr. Stuart joined the Customs service in 1897, and was stationed at Barrenjoey, Broken Bay. There, in May, 1898, he was the first to see and report the wreck of the steamer Maitland on the rocks at Cape Three Point. He was transferred to Sydney in 1901, and was attached to the warehouse branch. He retired in 1922. A widow survives him. The Commonwealth of Australia Act, 1901, transferred of the Customs Department to Federal jurisdiction. The collections of customs and excise by the New South Wales Government ceased on 31 December 1900 and the Broken Bay Customs Station was closed. As you may see from the letters found in National Archives of Australia, this took a few years. TELEGRAMS. Colonial & Intercolonial Messages. BARRENJUEE. Saturday. The tug Challenge, with a brig in tow, light in ballast, tried to make Broken Bay this afternoon, but, not succeeding, the brig anchored off Cape Three Points, and at 5 p.m. was still at anchor, having fore and main staysails set; but she seemed to be drifting fast to leeward. Wind, S. to S.S.W., blowing a gale, with rain, and the sea rising fast. The tug put into Broken Bay. The following small traders put in to-day forshelter :-Star of Peace, Prince Alfred, and Eliza. A fresh breezewas running strongly out of the Hawkesbury. Barrenjoey Customs Station at Barrenjoey - threads collected and collated by A J Guesdon, 2013. As we approached we met with all the materiel of a fishery. First, a long and apparently valuable seine was spread out on the grass a little above the beach to dry, und a boat hauled up on the sand showed that it had been recently used. Another, and a somewhat smaller, boat was moored out in deep water ready for use. A little further on, about ten or a dozen bushels of guardfish were spread out on the grass to cure, with small hopes, as I should imagine, of their drying under the influence of the weak and wintry sun. Next a small tent full of barrels of all kinds, but principally the light American oak flour barrels, showed the preparations for packing the fish obtained and dried during the summer season. Ten or a dozen yards further on was another tent,-the fish store-in which were piled up heaps of snapper and large-sized bream, all cured and ready for the Celestial consumption for which they had been prepared; and here we found the two Chinese, master and man, who owned the location. The master appeared a tolerably decent looking and intelligent man, who spoke English sufficiently well to be understood, and who very readily gave us all the information in regard to his fishery that we demanded from him. Their mode of procedure is this:-they fit out boats for persons willing to fish for them, of course keeping an account against them, for materials, rations, &c, supplied, and taking from them all the fish they catch suitable for curing, at a certain fixed price. The smaller fish they allow them to take into the Sydney market. In the season they have from fifteen to twenty boats at work fur them, principally manned by Europeans, besides which they buy from all who choose to come to them, offering to the fishermen the further convenience of the store they carry on, and from which they supply tea, sugar, and biscuit at a very small advance upon Sydney prices. We bought, at 3s. per lb., some really fine black tea, very much superior to any that is to be procured ordinarily at the grocers' shops of the metropolis. Sugar was 6d. per lb., similar to that for which 5d. is paid in Sydney ; whilst Wilkie's best cabin biscuits are retailed at 4d. per lb. As soon as the fish are procured they are cut open and gutted, lightly rubbed with salt, and then spread out in the sun to dry. In the summer this is very speedily and effectually done, although not without the fish obtaining that peculiarly rank and offensive smell that all who have passed by a Chinese store must have noticed. The supply of fish is allowed to accumulate during the summer, heaped in a tent devoted to the purpose, the heaps being occasionally turned, and every care taken against damp and wet; and so soon as the drying season is over-when the sun ís too far from the zenith as to have lost his power-the packing is commenced. No further trouble is taken in the packing, than to lay them in the barrels as closely as they can be got, and to press them down as hard as can be done with the hands. They are then headed up and forwarded to Sydney, to be distributed all over the interior wherever Chinese most do congregate. This season they had obtained about two hundred barrels of fish. Besides this fishing station on Pitt Water, there are also others at Brisbane Water, on Tuggerah Beach Lake, and on Lake Macquarie, all carried on by Chinese. There are several others also to the south-ward of Port Jackson, though my Chinese informant could not give me the names of the places where they ore established. All these fisheries have been formed by Chinese merchants resident in Sydney; that at Pitt Water belongs to a Chinese merchant in George street, whose name I could not make out, although I tried very hard to do so. The Chinese from whom I had these details was a kind of superintendent or manager of the fishery, keeping accounts against the fishermen with perfect correctness, and keeping the books of the station in the same way as an English storekeeper would do. He showed his board of colored beads by which he did all his reckoning, his multiplication, division, addition, and subtraction ; but after about half-a-dozen explanations, which he went through with most exemplary patience, neither of us could make head or tail of it, albeit Nat, who considers himself exceedingly clever at accounts, said he thought he saw what the plan was. Having purchased our stores, and obtained all the information we could from the boss, we filled our billy with water, and, obtaining the permission of the locataires, put it over their fire. When they found that we were going to take our midday repast, they brought out biscuit and butter and spread them before us, and when our pot boiled, produced their own tea and sugar for our use, thus performing the right of hospitality in true bush fashion. We were rather pleased at this, as we had previously imagined that the very last place to go to for a feed would be a Chinese tent. We made an excellent meal of biscuit, butter, and watercresses, and I think rather astonished master John at the quantity of comestibles that we managed to stow away. They had pressed us very hard to try some of their fish, and they certainly had a string of very fine fat mullet hanging up in their private tent, no doubt as a special delicacy, but neither of us could stand the odour, which nothing but long habit or absolute starvation could have overcome. All the stronger for our meal-snack, Tom called it-we lighted our pipes, resumed our loads, and bade adieu to our entertainers, thanking them for the kind hospitality which they had furnished, the more particularly as it had been unsought on our part. Crossing a bright clear brooklet that ran close to the rear of the tents, a couple of hundred yards brought us to a rocky headland forming the northern boundary of the cove on which the Chinamen were located. This we crossed by a miserable track knee deep in mud, and, arrived on the other side, we had Barranjuee full in front of us, about three quarters of a mile distant, with a long cleared flat, that had the appearance of having been at one time cultivated, lying between us and the mountain. This flat, which now intervened between us and Barranjuee, was scarcely two hundred yards across at the widest part dividing the Pacific from Pitt Water, and joining Barranjuee to the main. It is very low, and is fully exposed to whole sweep of the south-eastern gales that at some seasons prevail upon the coast, throwing up the waves in watery mountains upon the long beach that faces seaward, and scattering the spray in drenching showers right across into the bay. A dense scrub of ti tree and honeysuckle grows on the seaward side of the flat, forming a thick protecting belt almost up to the mountain, and this Nat and I determined to push through, whilst Tom went on ahead to the Customs station, whose white cottage we could see glistening brightly against the dark back ground of the vast cliffs of the mountain.